'Convert XLS' is 10-20 times faster than using Excel. It also allows for the saving and restoring of complex 'conversion jobs'. Specify a 'conversion job' within the command line or Windows scheduler and rest easy. Moving or deleting files while converting Excel files is no problem at all. This allows for easy, unattended conversion of whole folders. Convert up to 20 times faster when not using Excel. Automate 'Convert XLS' using the command line or the COM/ActiveX interfaces. Move or delete files after processing. Skip files already processed. Special processing of files including appending/concatenation, removing extra lines, search and replace strings and much more. Can be adapted for all languages. Convert Excel files to and from Text/CSV/HTML/XML without needing MS Excel to be installed. XLSX Conversion supported. Convert XLSX to CSV, XLS, TXT, HTML, XML etc. Convert Excel to/from to many file types. If Excel is installed you can convert any file it will open to/from to any file type it will Save As. See below for a full listing of all supported file types. Copy sheet data/formula from the same or different workbook. Specify ranges! Can be used to merge data from many sheets/workbooks. Need to Convert Excel Files? 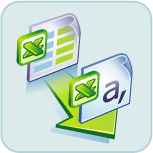 'Convert XLS' is a simple to use, yet powerful Excel converter utility specifically designed for Excel, fixed width text and CSV (character/comma delimited) files. If you need to convert/manipulate one or thousands of files, located in one or many folders this is the tool! Conversions can be done 10-20 times faster without using MS Excel. Repeat complex conversion tasks simply by restoring prior 'Conversion Jobs'. A 'Conversion Job' consists of all 'Conversion Tasks' that you specify to be done within the 'Convert XLS' user interface. This makes your future work to manipulate and convert XLS/XLSX /CSV/TXT files on a regular basis a mindless endeavor! The command line is one of the most widely known, accepted and implemented methods for allowing one software app to initiate another app. That's why we've made it our goal to make all of our software command line able. Special Promotion: Buy 'Convert XLS' and get 'Text to Excel Wizard', 'Convert Doc','Convert Image' and 'Convert PowerPoint' free! NOTE: 'Text to Excel Wizard' is free with 'Convert XLS' and it can handle all your text file to Excel/CSV conversions. More info on using the command line? Although we'll discuss the use of the command line here, it's only to give you a taste. For the full, accurate, and up to date information see the 'Convert XLS' command line documentation. There you will also find a full list of examples and how to troubleshoot. See using the Windows Scheduler also. NOTE: After installation, you can find several simple batch (*.bat) files for quick and easy usage by going to Start\All Programs\Convert XLS\Example Batch Files. These will work without modification provided the installation was in the default folder. Email us at if you have any questions or need additional examples. We will get you up and running fast! ConvertXLS.EXE /J"D:\My Conversion Job Files\AccountingBatch.SII"
NOTE: Items in bold can be converted without Excel being installed. (*.TXT) Unicode Text. Tab delimited. (*.TXT) Text (MS-DOS) Tab delimited. NOTE:'Convert XLS' conversion method only. (*.TXT) Tab Delimited Text File. Platform Independent.
" tab (command line see /N switch). (2)No longer supported in MS Excel versions 2007 and above. (3)Versions of Excel 2007 and up will support this file format. PDF and XPS require the "Microsoft Save as PDF or XPS" add in. Go to Microsoft's web site and search for "Microsoft Save as PDF or XPS add in". "Thanks. The product is terrific. It did exactly what I needed it to do. I had 1321 text files I needed to convert to Word. It did it in about 6 minutes." 'Convert XLS' Downloads. Time tested for your demanding requirements. 'Convert XLS' is compatible with Office 97 through Office 2016. Yes, we've been at it that long! When using Excel to do conversions or special processes: More user friendly error messages are being created to assist users with faulty Excel installations. User interface Conversion of Excel files: When specifying *.xls* for the input file, the sheets to convert parameter was being reset to all sheets (*). User interface Conversion of Excel files: When specifying a range, it is forced to UPPPER CASE. Range is case sensitive, and only upper case seems to work.